Publisher: New York, Viking: 2007. Synopsis: The children all contribute to the birthday dragon costume, then at recess go outside and dragon dance around the playground, imagining themselves in all sorts of different locations and situations. Words in bold type, such as “stomp, bomp-tromping” and “whish-whoosh” imitate the sound or look of their actions. 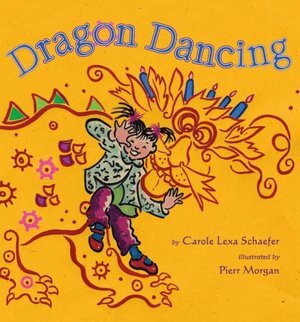 Activities/Resources: Although this book is about a birthday celebration, its use of the image of dragon dancing can be a good way to introduce lessons about Chinese/Lunar New Year. There is a listing of picture books and resources for celebrating Chinese New Year at Ready, Set, Story, a blog of the storytime features at Naples, NY library. Scholastic also has Chinese New Year activities. There are videos on YouTube of Dragon Dances, and Chinese New Year Parades. Kids would have fun making their own dragon the way the children in the book did, and imagining other places the dragon could go and other things the dragon could do, even doing their own Dragon Dance. There are facets of the book that lend themselves to other activities as well. The word onomatopoeia may be a tough one, but the concept, words that imitate sounds, is one kids can readily grasp. Here are some suggestions for activities. Availability: In print and readily available. Sounds like a great book that can inspire a lot of fun. Thanks for mentioning it. You’re welcome. There are so many possibilities for fun this book introduces through art, dance, and imaginative play. I love your idea of using this book to introduce onomatopoeia, Beth! It’s a book with really multiple possibilities for further activities. It’s the old English major in me coming out, with the thoughts about onomatopoeia! It would be such fun to use this with a class, and see where their imaginations can take them. Sounds like a beautiful book with many great activities that kids would fnd enchanting. I particularly like the idea of introducing how another culturure celebrates the New Year, steeped with tradition that kids would find fun! Great selection. Thanks, Pat. Without mentioning the Lunar New Year, it still gives a fantastic springboard for discussion of this concept, and of multiculturalism in general. The Dragon Dance is such an integral part of the Chinese New Year celebration, that it naturally lends itself to that. In my city (and in others) we have Dragon Boat races one weekend each year, and the weekend always starts with a Dragon Dance — that’s another event that could be tied to the use of this book. Wow, in Canada. That’s amazing. I’m sure the Chinese communities celebrate, but I live in the midwest, so I don’t see ceremonies and events like this. Cool! There are thriving Chinese or Asian communities in many Canadian cities, but the Dragon Boat races transcend any one culture and are a major event for many in our prairie city. My kids love learning about other cultures. I can see this book holding their attention with the information on how they celebrate. I showed my daughter the video and she loved it. Thanks for sharing Beth. I’m sure your daughter will enjoy the book. Although it focuses on using a Dragon Dance as a birthday celebration and a lead-in to imaginative play, it can be a springboard to so much more. Thanks, Jennifer! Great choice for this time of year especially! This book looks really fun on many levels! And so many great-looking activities! Thanks so much for sharing. I’m glad to have another Chinese New Year type book on the list, what with it coming soon! I’ve been waiting and waiting for this time of year so that I could share this book! Oh, great to hear from someone who is not only familiar with it, but has checked it out multiple times! That’s a sure sign of a good book! It looks like a fun and colorful book. Lots of great activities too. Through the PPBF series, I feel like I’m rewiring my brain as a writer and parent to think of a way to add a new layer to the books. Thanks, Robyn, I haven’t heard of this book. Great review. Thanks, Barb. I hope you’ll perhaps find the book and read it. This looks like a fun book, and perfect for Year of the Dragon. Onomatopoeia books are so much fun to read aloud. You mentioned dragon boat festival – that is so cool that your town celebrates it. I, naturally, think primarily of the food associated with it (bamboo-wrapped sweet rice). I wonder if there are any English-language children’s books about Dragon Boat Festival. Heehee. I knew it! Let me know if your search is fruitful. Haaaaa!! this is fun and super and full of delightful energy!!! You would love the squiggles and swirls of the art in this book, Robin! Thanks, Diane. Cool about the mural you painted! And thanks for the links. They’ll enhance the experience for future readers. This seems like an interesting book! I like the idea of the kids pretending to be dragons! PLUS, I love… onomatopoeia! The sounds, name, AND meaning are what I love about onomatopoeia!!! I like learning about different cultures and religons! How cool that you love onomatopoeia! Aren’t words fun? Beth, I love reading books to kids about Chinese New Year. So many of my students have never heard of it and are fascinated by the celebration when we read about it. This looks like a great read-aloud! At the private school where I worked ten years ago, we actually held a Chinese New Year parade with dragon and all-it wound all through the pre-school, lower school, middle, and upper school. My kids looked forward to it every year. I miss that! This would be a great read-aloud, although technically it’s about a birthday Dragon Dance. Kids would have a great time cooperating to make their own dragon after hearing this book. I love the thought of that parade through the school! Love the resources and activities to extend the learning experience! PPBF is a fantastic way to connect with books that we wouldn’t have encountered before. I nearly always end up with a stack of requests at the library because of PPBF! And I love the resources both as an add-on and as a way to get my own thoughts digging deeper into the value of any book. A perfect choice for the Chinese New Year week! Great review. I think I’ve read this one before, but I am going to check it out again at the library next week. Thanks! Thanks, Loni. I think you’ll particularly enjoy the way the illustrations take off and add so much to the text. How delightful — and a proof of how multicultural the world has become — that your first Chinese New Year experience was in Spain. I love that! Thanks so much, to both you and Carole, for such a wonderful book! acids and harsh abrasives which can weaken the tooth’s enamel over time, which can just make the problem worse. This is actually the only way that you will be in a position to decide whether you require the services.